From what I understand, “dopiaza” is a Persian word that means either “two onions” or “twice onions.” In some dopiaza recipes, it is obvious that the name refers to using twice as many onions as possible. In others, it is apparent, that it means onions are added in two different stages. In mine, it means that two different kinds of onions are used, in copious amounts, added at two different points in the cooking process. I like dopiaza curries, which are said to have originated in the court of Mogul emperor Akbar the Great, or in the kitchens of the Nawabs–provincial governors of the Muslim Mogul Empire in North India. Some say it originated in Hyderabad, but I have also seen Bengali and Punjabi versions, so I cannot say for certain where this style of cooking meats came about. I just know that it tastes really, really amazingly rich, and results in very tender meat and a rich sauce. Chicken, rabbit, beef or venison could all be cooked in this way, for delicious results, but what I had was fresh local lamb, so lamb is what we ate! My version of dopiaza includes a browned onion sauce, made by deeply browning a large quantity of thinly sliced onions, then grinding them into a paste with fresh ginger and garlic, chilies, and whole spices. This fragrant, steaming warm paste is then added back to the pot with the meat as it browns, then yogurt and water is added and the curry is cooked until the meat is halfway tender. 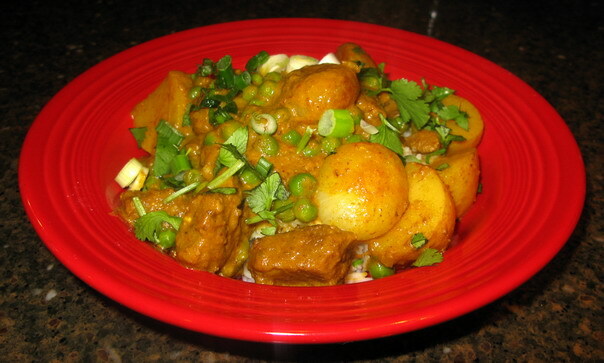 Then, halved new potatoes are added while the curry simmers, as well as my second dose of onions–caramelized whole baby onions–my version uses onions both as the main ingredient in the sauce, and as a vegetable. Then, the sauce is allowed to reduce a bit before a second amount of yogurt along with a squeeze of lemon juice is added to finish the curry. To garnish the dopiaza I stir in roughly chopped cilantro leaves and I sprinkle the surface with a third shot of onion flavor–thinly sliced scallion tops. Before I give you the recipe, let’s talk a bit about the whole baby onions. 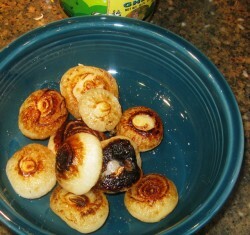 The type I used, which are flattened and shaped rather like fat disks, are called in Italian, cipollini. They are lovely little onions, with thin, pale yellow to pale golden brown papery skins, and a sweet, crisp character that turns meltingly rich when caramelized, and they are increasingly visible in American markets. They are also easily caramelized whole in a pan, because they are flat on the top and bottom–there is no chasing them around the pan with a spoon or spatula. You put them in the pan on their heads or bottoms, let them brown on that side, slip a spatula under them, flip them once, and they brown on the other side! No skittering about like playful kittens in the ghee! They do just as you tell them to. But, the truth is, if you cannot find cipollini, plain old tiny pearl onions will do. They are tiny round onions, with either white, pale gold or yellow skins or even thin red skins, though white is the most common. They are not quite as sweet as cipollini, but once they are caramelized then braised in the curry sauce, no one is going to complain about how they taste at all–they will taste amazing. But, you are going to have to be a little patient with these little round rascals as they roll hither and yon in the pan dodging your spoon as you try to keep them browning evenly. To peel either sort of tiny onions, cut off the tops and roots in thin slices, then carefully peel off the skins with your knife and fingers, leaving the onions essentially whole. I used ghee to brown the little onions because it gives a superior flavor to the dish, but if you are worried by saturated fat, canola oil works well, too, though the resulting flavor is not quite so rich. Dopiaza like many other curries, only improves with flavor as it is kept in the refrigerator overnight, so if you want, you can make it several days ahead of time and reheat it just before service. This is one of the ways you can put on a large Indian feast without making a hash of your nerves the day of your dinner party–make all of the curries in the days ahead and just reheat them on the night you have your guests over. That way, you can take up your time the day of the feast with making appetizers, rice, and fresh breads for your guests. Heat first measure of ghee in a heavy-bottomed pan or pot over medium high heat. Add the peeled whole small onions, and cook, stirring as needed until they browned all over the outside, or in the case of cipollini, are browned deeply on the top and bottom and are browned lightly on the sides. When done, remove from the pan and set aside to be added to the curry later. In the same pan, heat the second amount of ghee or oil and add the four cups of thinly sliced onions. Sprinkle with the salt and cook, stirring, until they turn deep reddish brown. Remove from the pan, leaving behind as much oil or ghee as possible, and set the pan aside and put the onions into a grinder or blender with the garlic, ginger, chilies and spices–even the ground up ones–and grind to a fine paste. It should look like the reddish brown, steaming paste in the photograph in the post above. If you use a blender, add a little bit of water to get the paste to smooth out–and if you use a blender, you will likely have to grind the spices beforehand in a mortar and pestle or a coffee grinder. Return the pan to the heat and add the lamb cubes. Brown until most of the pink is gone, then add the onion paste mixture back to the pan, and cook, stirring, until the meat is fully browned and the sauce is fragrant. Add the yogurt, and if you are using a pressure cooker, 1/2 cup of water and scrape all the browned bits sticking to the pan up and dissolve them into the liquid. If you use a pressure cooker, scrape the contents of the pan into the cooker, and put over high heat, bring to a boil, lock down the lid and bring to full pressure. Turn the heat down to low, and cook on full pressure for fifteen minutes. If using a regular pot, add the full measure of water–two cups–and the yogurt and deglaze the pot as directed above. Bring to a boil, turn down heat, cover pot and simmer until the lamb is just fork tender–about forty-five minutes. After lamb is cooked, in pressure cooker–quick release pressure, open pot and add the potatoes and little whole browned onions. Bring to full boil again, lock the lid down and bring to full pressure. Turn the heat down to low and cook for seven minutes, and then let the pot sit off heat for two minutes, then release pressure and remove lid. If the sauce is watery, simmer for a few minutes to reduce it. If using a regular pot, add potatoes and onions after the meat is mostly tender, and cook until the meat is fully tender, and the potatoes and onions are perfectly fork tender. Remove lid halfway through the potatoes cooking, to help reduce the excess water from the sauce–and reduce until the sauce is thick enough to coat a spoon once the curry is cooked. Add the yogurt to the thicker sauce, and stir well. Just before serving add the salt to taste and the lemon juice. 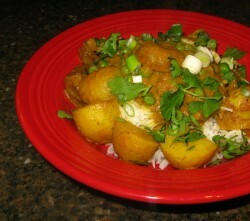 Stir in the cilantro, and serve over basmati rice, with a liberal sprinkling of scallion tops as a garnish. Note: If you cook chicken or rabbit this way, don’t use the black cardamom and instead, add a 1/4 teaspoon fennel seed to the spice mixture. There’s protein in peas. In potatoes and onions too – just not as much. Using “protein” as shorthand for “meat or meat substitute” only reinforces the stereotype that vegetarianism is something unhealthy or unnatural. The curry sounds delicious, though – I’ll have to make it sometime, probably with the not-at-all-traditional pan-fried tofu. Usually I avoid curries – there aren’t many foods that I just don’t like but they all tend to show up in Indian food – but this one I’m going to try. I already wrote my shopping list for the weekend’s farmers market trip. 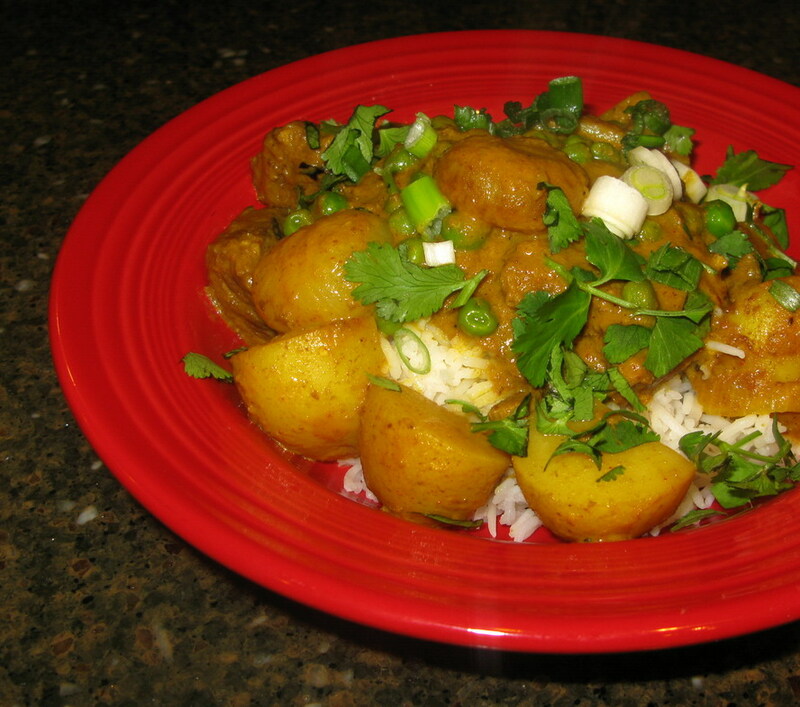 I rarely have good recipe title ideas but one popped into my head for this one: Onions Cubed Curry. “Onions” plural because of the several types; “Cubed” because you have them in three dimensions: type, cooking method, time added. Me again – I just read the instructions closely. You have us add the yogurt both before and after the lamb is cooked. Clarification, please. Never mind, I should have read the ingredients list just as closely. Carry on folks, nothing to see here. Joanna, I think you are being a little bit sensitive to the idea that I am presenting vegetarianism as “weird.” I am not, and even though I am an omnivore, I support vegetarians, vegans and almost vegetarians life choices and dietary restrictions. Harry, you answered your own question. But, I also love the name–Onion Cubed Curry is a great idea! I made this tonight — sort of. The sauce is fantastic. I had to make a couple substitutions, though. One, I subbed shrimp for the lamb, adding it near the end to cook in the sauce. Second, my grocer was unexpectedly out of perl onions, so I used shallots. That was the one problem; shallots actually need to cook a bit longer than onions do … they’re stronger-tasting. Fuzzy–It would be fantastic with shrimp, though I cannot eat them anymore, I can still tell it would be good with them. Shallots are stronger, but they are a nice addition to the recipe, I bet. I will have to try it this way next time. What do you use to grind spices and curry pastes? I’ve been unable to obtain an Indian grinder, despite multiple tries. I have an older Sumeet grinder, from India, that my husband got me for the Generic Winter Holiday about twelve years ago. It is only now starting to falter–and I have really used it to death. Before that, I used a cheap coffee grinder for the dried spices–and it worked great, so long as you never use it for coffee again. 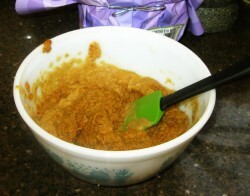 And, I used a really good small food-processer/blender with the wet ingredients, but I had to add a bit of water or broth to make a smooth paste.Then, I would combine the dry and the wet together in the processor and give it another whir or two to mix them.